Over the last few days, we have seen a raft of poor economic data weigh on a potentially strong week for the spread trading markets. Today's economic calendar will see us close the week rather quietly, with only the German Ifo survey to get our teeth into. Considering yesterday's worse than expected services number, and despite the Spanish bailout and positive Greek elections, we could see the expected decline to 106.2 come in even lower. A slump in investor sentiment weighed on the euro as output figures around the world tumbled, sending everyone into the safety of the US dollar. There are now growing expectations that the ECB will ease its monetary policy to help deal with debt ridden Greece, Spain and Italy. The EUR/USD forex market lost 149 points to $1.2548 as the Eurozone is being confronted with additional pressures on its banks and sovereigns. The Fed's action of extending the maturity of its balance sheet assets failed to impress the forex spread betting markets which were expecting more from Ben Bernanke. 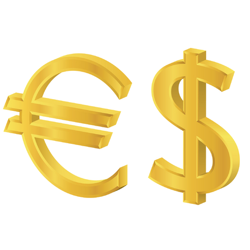 After dropping initially, the euro actually recouped its losses against the dollar. However, this morning, the single currency is pushing a little lower in line with the weakness in other risk assets, trading at $1.2660 at the time of writing. Downside pressure is also coming from speculation that the European Central Bank might consider a rate cut at its meeting next month. Despite some surprisingly weak figures for German economic sentiment, the euro/dollar rate rose by 113 points to $1.2688 yesterday. This came in anticipation that the Fed will pledge more measures to stimulate the US economy. At the same time a world leaders' summit in Mexico was also a supportive feature as it promised more coordinated action around the globe to boost growth. The pro-bailout New Democracy party won the Greek election by a narrow margin and the initial reaction pushed the single currency higher against the dollar. However, forex investors soon reconsidered their position as the formation of a coalition government could prove to be a difficult task. In addition, the yields on Spain's debt rose above 7%, a euro-era high. This sent the euro tumbling 136 points, closing the day at $1.2575. This morning, the EUR/USD pair is slightly higher, hovering around $1.2600. The EUR/USD pair is now at $1.2625/26 and is just above a solid support level at $1.2610/20. Below here support comes at $1.2580/90 and then further down at $1.2435/45. On the upside, we can see resistance levels at $1.2670/75 and $1.2745/55. Today may well be a case of damage limitation and 'sitting on hands' as spread betting investors try to get a handle on sentiment and support. The pound had a great day Friday on as funds flowed away from the euro prior to the weekend. We are back up to $1.5660 at the moment, a level not seen since late May, having visited $1.5270 in the meantime. The GBP/USD forex market has oscillated around $1.57 for the last three years and there seems no real reason for us to believe that this will change. The economic problems for the UK are the same problems for most of the world, including the US, and so the attraction of one currency over another is hard to evaluate. Yes we can point to various items, such as inflation, deficits, growth, tax, interest rates etc. However, the major currencies all seem to have their fair share of problems. From a technical analysis point of view, we can see resistance at $1.5690/00 and $1.5745/55 and support at $1.5640/50 and then down at $1.5600. Although, at the moment, it does not look like we are trying to pressure either end. The nervousness surrounding the euro will naturally continue through today's session and we may be at risk of sharp reversals. The sterling/dollar market seems to be quite comfortable in the $1.55 region and this represents the mid-point of the last three years of trading. The pair is seeing a little bit of weakness this morning after the BoE's announcement that it will be lending an extra £140bn to banks. Support is seen at the $1.5475/85 level and then $1.5435/45 and $1.5400, whilst resistance is currently at $1.5555/65 and $1.5600. The currency markets seem to be particularly treacherous at the moment. Even professional forex traders can't seem to decide whether any news is good or bad for their chosen markets. After last weekend's volatility, it would be a brave trader to commit too much ahead of the Greek election. As a result, we are likely to see an overall flattening of exposure. The euro, currently quoted at $1.2580/81, seems to have settled into the $1.25 region quite comfortably. A speculative exit of a weaker member state might actually draw in buyers, however, any further printing will drive the euro lower. Longer-term we are probably looking at $1.18 to $1.42 being the range, but where it will go in the meantime is anyone's guess. Support is offered at $1.2545/55 and $1.2520/25, whilst resistance is actually just above the current level at $1.2595/1.2605 and then $1.2640/50. The GBP/USD spread betting market has recently traded all the way down to the major support levels at $1.5250/1.5300, which have dominated trading for two years. However, the pair seems to have decided that, as with the last four attempts, there are not enough reasons to drive us lower just yet. If economic numbers continue to disappoint, coupled with further QE and lower interest rates, then the attraction of sterling may wane even further. It was only a few weeks ago that we were pushing up to the low $1.60's. The fact is that sterling has oscillated in a $0.12 range, from around $1.5250 to $1.6450, for nearly two years. In all that time it has shown little appetite for a break out. Today sees support at $1.5470/80 and $1.5440/50, with resistance at $1.5505/15 and $1.5535/45. Economic data comes in the form of EU industrial production this morning, which is expected to fall. At lunchtime, we will see producer prices and retail sales from across the pond, and these are also expected to decline. Nevertheless, the focus will really remain on the Eurozone, in particular the fast approaching Greek election at the weekend. We saw a sigh of relief yesterday as the European Central Bank backed a proposal to guarantee bank deposits. This sent the euro higher against the dollar, gaining 39 points to $1.2504. Earlier in the day, credit ratings agency Fitch had announced its forecast that Spain will miss its budget deficit. This pushed Spanish yields closer to the 7% danger zone. In the forex spread betting markets this morning, the EUR/USD pair seems to be taking a respite, trading at $1.2515. Yesterday the euro opened higher versus the dollar, reaching an intraday high of $1.2668, largely on hopes that European officials mean business. However, the viability of Spain's multi-billion-euro aid plan came into question and the risk-off sentiment in the global markets took over once more. The session ended sharply down at $1.2465. This morning EUR/USD is a little higher following the sharp reversal and is trading at $1.2500. Fitch downgraded Spain's credit rating by 3 notches to triple-B on Friday, which dragged the EUR/USD spread betting market lower. However, renewed hopes that Eurozone governments might work together for long enough to solve their problems, sparked something of a recovery. Unfortunately, it wasn't enough to pare all the early losses, and the single currency closed 57 points lower at $1.2504. Having said that, the news that Spain has sought €100 billion to prop up its banking system has already boosted the euro in the forex markets this morning.